on May 4 in the Netherlands. since the outbreak of World War II. 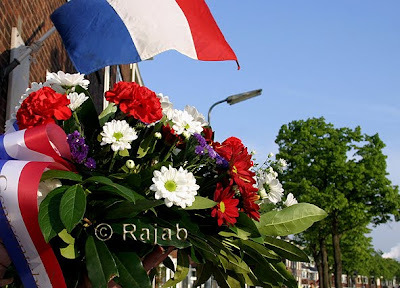 Until 1961, the commemoration only related to the Dutch victims of World War II. (such as in Lebanon or Bosnia) are remembered on May 4 as well. at the National Monument on Dam Square. Netherlands. Public transport is stopped, as well as all other traffic. Radio and TV only broadcast the ceremonies from 19.00 until 20.30.
are then hoisted to the music of the "Wilhelmus", the Dutch national anthem. Since 2001 the new protocol says it is correct to let the flag hang half-staff. a monument, listen to speeches, and lay down flowers to remember the dead. the German occupation of 1940 to 1945. In Nederland vindt jaarlijks op 4 mei de Nationale Dodenherdenking plaats. in oorlogssituaties en bij vredesoperaties. en vredesoperaties (zoals in Libanon, Bosnië of Afghanistan) herdacht.